Bezel El (Shadow of God) depicts the one reaching and abiding in the secret place, seeking to be taught by the LORD. As a result, He responds with the depths of His mysteries which sets fire to the heart of the one pursuing Him. Psalm 91:1 (NKJV) He who dwells in the secret place of the Most High Shall abide under the shadow of the Almighty. Daniel 1:17, 20 (NKJV) As for these four young men, God gave them knowledge and skill in all literature and wisdom; and Daniel had understanding in all visions and dreams. … And in all matters of wisdom and understanding about which the king examined them, he found them ten times better than all the magicians and astrologers who were in all his realm. Beloved, the key is to call. Too many desire intimacy with Me, but don’t pursue Me. Too many long to share in My mysteries, yet never even ask. Resist the urge to leave the pursuit to Me, and ask, seek, and knock – for the door will be opened. Make time for Me. Make space in your life and quiet your heart. Listen for My voice. You will have trouble hearing if you are forever speaking, so be intentional about being quiet. Then trust My voice. Trust that it’s My voice you hear and that I can correct you if you are led astray. Keep your heart set on Me and refuse to allow your focus to be drawn away. I AM worth your attention, beloved, and I have so much I long to share. A “Lion Bite” called “Desire” from Glasgow Prophetic Centre is connected to this. 1 Corinthians 12:31 Now eagerly desire the greater gifts. And yet I will show you the most excellent way. It is time to shift your desire to another level. It is time to deliberately and boldly work up your eagerness for God. It is time to make a daily, hourly choice to eagerly desire the gifts of the Spirit in your life. Watch and listen to yourself carefully today: Check how many times you think or say, ‘I really want to…’ or, ‘I’d really like…’ or, ‘Today I really must…’ or, ‘I need…’ or, ‘I’d love…’? Every time you catch yourself saying, ‘I want’ or ‘I need’, add another request – ‘…but even more, I want to use the gifts you have given me, Holy Spirit’. 1 Corinthians 14:1 Follow the way of love and eagerly desire gifts of the Spirit, especially prophecy. A Meditation of the Word by Elisa Eaton of Waiting in the Wings is connected to this. It is called “The Father’s Stellarium”. John 5:19 (NLT) So Jesus explained, “I tell you the truth, the Son can do nothing by himself. He does only what he sees the Father doing. Whatever the Father does, the Son also does. Several times I have had visions of a place in heaven I call the Father’s Stellarium. It is like a place in His mind where He first conceived of the universe. When He brings me to this place, I feel as though I am flying amongst the stars of the heavens—except it is far more vivid than this reality. Many wonders and mysteries are hidden in this place waiting to be found. It is a treasure trove of the Father’s infinite wisdom and knowledge. But it is also in this place where I continually see that His greatest treasure is you and me. The Father’s Presence and great love for us permeates the whole atmosphere. Being in the stellarium always makes me feel like a child in her father’s tinker shop. This is the place where I get to be close to My Father’s heart. And being close to my Father’s heart means I can learn from Him. I have access to ask Him questions. He shares His thoughts and His future plans with me. My own creativity is stirred from this place. And what I learn in this place impacts my daily life on the earth and the work that I do for His Kingdom. A Word by Sandy Warner of the Quickened Word is connected to this. It is called “Handfuls of Purpose Just for You“. I love how you love My Word and My provision! I see you treasuring each morsel, making sure nothing is lost. Beloved you stir my heart so deeply for your passion and joy over even the smallest details of what I provide. You have earnestly sought Me and not given up. You have given honor to Me as your Provider. I love you so much that I will move heaven and earth to send you angels from all over the world, to walk before you, dropping even the smallest details on purpose, just for you. You are My dear, dear one and you will always be given more than enough. I rejoice when you rejoice and I AM satisfied when you are satisfied. A vision called “The Angel of Purpose” from Anna Rountree’s blog is connected to this. Early this morning (right after awakening) I kept seeing myself standing on the back of two porpoises – one foot on each – plowing through the water of the sea. I held reins that were attached to some sort of bridles or harnesses that guided both. I saw this vision over and over again. Even though I saw this vision over and over. I did not know its meaning. Before we arrived at the gazebo, I saw this vision again. I was riding on the two porpoises – one foot on each creature. One porpoise dropped off at the ministry location where I write. The other continued to the top of the ridge. One of the questions most frequently asked when people visit Prayer Mountain is: “What is my calling? What is my purpose? Even as the disciples were looking for their calling and Saul who became Paul, all of us are seeking. Of course our purpose changes throughout our lifetime. Also because of our years with the Lord and the number of tests we have met and passed, we become more valuable to the Kingdom – (better prayer warriors.) Also the visibility and size of the calling changes. Sometimes we are required to be highly visible. Sometimes, entirely hidden. But as my friend Bob Jones always said: “The pays the same.” Our job is to stay in the will of God. But as each set of duties expires along the way, we are again faced with the same questions: what’s is the calling now? What is my purpose? We want our lives to count for Christ. All of us wish to live up to the very edge of the possibilities the Lord has for us. Or more than that. We want to lean as far over the edge as possible. 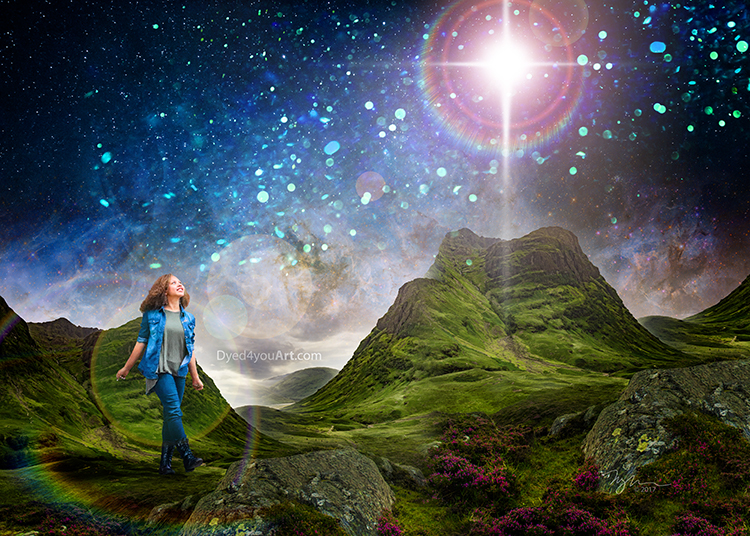 Knowing that His children will be coming to Prayer Mountain in search of these very answers, the Lord has supplied this particular location with a choir of Angels of Purpose to assist those who come. In Jewish tradition, they say that when Moses came to Bezalel to begin building the tabernacle and it’s furnishings, Moses mentioned them in an inverted order (the tabernacle and then the furnishings). Bezalel told him that there must have been some mistake because one would usually build a house first and then afterwards provide the furnishings. Other examples sited within Jewish tradition state that Bezalel perceived things about the tabernacle and furnishings that Moses could not. 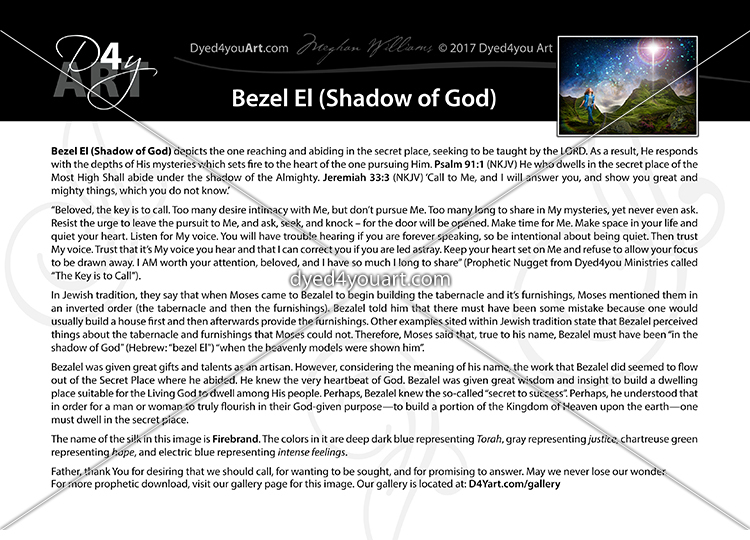 Therefore, Moses said that, true to his name, Bezalel must have been “in the shadow of God” (Hebrew: “beẓel El”) “when the heavenly models were shown him”. Bezalel was given great gifts and talents as an artisan. However, considering the meaning of his name, the work that Bezalel did seemed to flow out of the Secret Place where he abided. He knew the very heartbeat of God. Bezalel was given great wisdom and insight to build a dwelling place suitable for the Living God to dwell among His people. Perhaps, Bezalel knew the so-called “secret to success”. Perhaps, he understood that in order for a man or woman to truly flourish in their God-given purpose—to build a portion of the Kingdom of Heaven upon the earth—one must dwell in the secret place. A portion of a word called “Who Will Stand In The Secret Counsel of the Lord?” from Wayland Henderson of Greater Works Generation Ministries is connected to this. …The common thread of the apostles and prophets is that they spent intimate time with Jesus and not only revealed the mystery of His will, but became witnesses of His resurrection by manifesting His nature. We see the same with Jesus as He spent intimate time with the Father. He did more than unfold the mystery of Father’s will in words, but become a witness of the invisible Father in the earth (John 14:9). Jesus even goes as far to say, “If you don’t believe the Father is living in Me then believe the works that I do testify of His nature coming out of Me” (see John 14:11). The progressive revelation and mystery the Lord is revealing to us is the foundation the Church is built on: the Blood of Jesus gives us the the ability to abide in the realm of intimacy and receive the secret counsel of His will. As we spend time in that place we are transformed to not only bring a message, but be a manifestation of that message in the earth and the demonstration of His power, glory and nature coming out of us will testify of this! If the world wanted to see the Father, it was the Son that manifested Him. This is the season where if people want to see the Son, the Bride will manifest Him! Just as Jesus was in the bosom of the Father and declared Him, the Bride who abides in the bosom of the Son will declare Him as well. The foundation the Church is built upon is that we have access to be in such union with Jesus, that the world does not see us but only sees Him because our life is hidden in Him (Colossians 3:1-3). A portion from Annie Schisler’s “I Saw the Lord: Annie’s Visions” called “The Liquified Ones” is connected to this. “When He took me into His glory Cloud, He showed me a very high and holy place – the Place of His Presence – which He had prepared for His own ones. After carefully forming many entrances in this place He then proceeded to close them up, covering them over and sealing then so that no person or thing could get through them. Within this place there was a great secret which, like a huge key, would unlock and open all these numerous closed entrances. This secret, nevertheless, was carefully hidden within the place itself, which was completely closed and sealed. All around this place and outside the sealed entrances flowed a great quantity of a strange substance – a liquid which looked like water but wasn’t. This substance was composed of human beings who, having been melted, had come into what appeared to be a liquid state, and were thus enabled to filter through into this closed and sealed place. The only way to enter it was to become like liquid and then flow or filter through into the place that held this great secret. 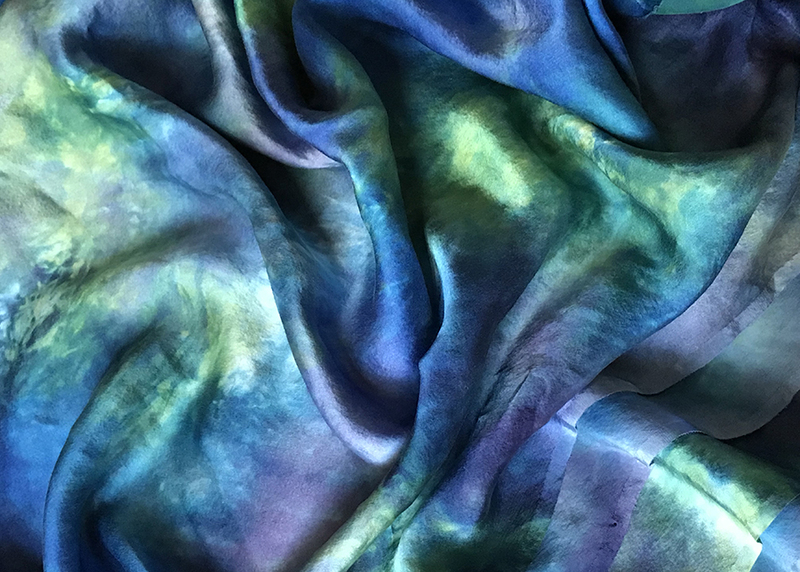 The lyrics from Bethel Church’s song “Wonder” are connected to this silk. The name of the silk in this image is Firebrand. The colors in it are deep dark blue representing Torah, gray representing justice, chartreuse green representing hope, and electric blue representing intense feelings. Father, thank You for desiring that we should call, for wanting to be sought, and for promising to answer. May we never lose our wonder.